All around them, a new evolution in art was taking place, one that would come to be known as the period of the greatest artistic rebirth, the cultural bridge from the Dark Ages to the Modern era. You could smell innovation and enlightenment in the air. Da Vinci’s Disciples didn’t care that as women they were prohibited from taking part. They would take part; they were determined to make their mark, no matter the consequences. So it is to Florence we go. First I must tell of my own connection, one I didn’t know existed until after I wrote my fourth book, THE KING’S AGENT. Yes, in that glorious small speck of time between completing one book and starting another, I sent out a query to an organization that researches surnames. 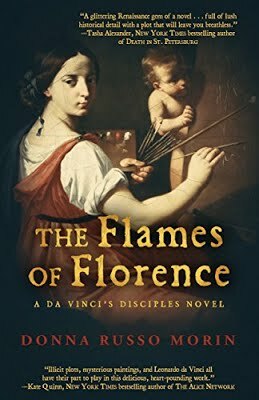 It took them a while to complete the appropriate investigation, during which time I developed the basic idea for the DA VINCI’S DISCIPLES trilogy also set in Florence, telling HERstory on the birth of the female Renaissance artist. It would seem as if my fascination for the ancient city was firmly entrenched in my psyche. The information, when it came from the research institute, wonderfully illustrated with my family crest on parchment looking paper, declared that the origin of my family was, most probably… Florence. My ancestors have been calling, and I am answering that call as best I can. 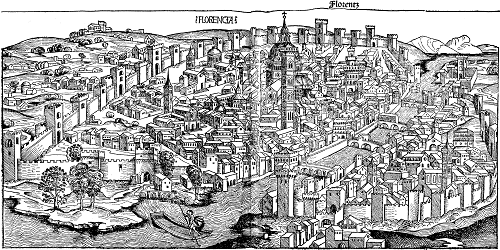 Julius Caesar named the city ‘Florentina’ (meaning ‘flourishing’) when founded in 59 BC as a military retirement haven. How portentous the name would come to be. Yet there is evidence of occupation dating back to prehistoric times. Caesar developed the city, true, with the assistance of the great Roman general and statesman Lucius Cornelius Sulla, from a military state of mind, one that is still in evidence even today. Situated on a major artery leading to Rome, the Via Cassia (still known by that name in the heart of Rome, as the A1 for hundreds of miles leading throughout the country) it was rich with fertile farmland. The combination proved successful and it soon grew from a small Roman settlement to a lively commercial epicenter. Christianity made its way to Florence in the second century and by the next, churches began to spring up like the shoots of spring flowers. Today there are close to forty churches and it is these religious houses that are partially responsible for the birth of the Renaissance. Like so many other locations in Italy, Florence was prey to the pillaging of the Barbarian invasions of the Dark Ages. And though the city built more interior city walls, they too fell to the Lombards, the dark period of the city’s history. Any great accomplishment or movement or change in the direction of human kind, does not come about because of one circumstance or the efforts of one human, but from a conglomeration of magnificent events…the perfect storm. Such was the Renaissance and its birth in a city named Florence. Its inception can be found, in part, in the politics of the city. A strife-ridden communal system gave way to an oligarchy, a system that would rule the city on and off for hundreds of years. The greatest of all the oligarchies belong to the Medici family, major players in the trilogy. Yes, these were men who had undeniable, dare I say obnoxious, certainty in their superiority, but they were also gifted with open curious minds whose craving for knowledge and truth and beauty brought new and enlightening concepts to within the city walls. Harking back to the teachings of the Greeks and the Romans, they revived the value of the human being and, within this eagerness for knowledge and enlightenment, Humanism was born. Man came to consider himself God’s greatest creation and combined with a craving for rational thought and an affirmation of the natural environment in which he existed. A distinctive characteristic of Humanism was the glory of art, of man’s ability to manipulate media into whatever form they chose. But it was not only painters and sculptors that Florence and its rebirth produced, though there were those a plenty, to name a few: Giotto di Bondone, Masaccio, Domenic Ghirlandaio, Perugino, Michelangelo, Raphael, Botticelli, Titian, and, of course, Leonardo da Vinci. And those are just the upper echelon of painters. Architecture reigned supreme as well under the skillful hands of Brunelleschi (the architect of Santa Spirito cathedral; the opening setting of THE FLAMES OF FLORENCE and the church which hides their main studio), Leone Alberti, Palladio, and Bramante. And their glory was all written about with equal talent by the writers of the age: Petrarch, Boccaccio, Luigi Pulci, and Poliziano. In fact, so many of Italy’s greatest writers and poets were connected to Florence, its dialect came to be known as the official Italian language, beginning with the appearance of Dante’s Il Divina Commedia. The power of Florence was felt in almost every facet of Renaissance life. The currency of the city, the gold Florin, came to be the most valued, not only in Italian but to all the corners of Europe, from Hungary to Britain to Bruges, and everywhere in between, and helped to develop industry across the continent. It has been such an honor not only to write about the artists and innovators of the Renaissance, to write about the women that surely existed who longed to be part of this unforgettable evolution, but to write about the birthplace of family. Vinci all have their part to play in this delicious, heart-pounding work." art forms, Da Vinci's Disciples call him an enemy … but not all of them. periods in Florence's history in bright colors and with vivid descriptions.